A beginner’s favourite, the Orion 09798 StarBlast 4.5 Equatorial Reflector is a very fun and easy to assemble scope, suitable for both children and adults. 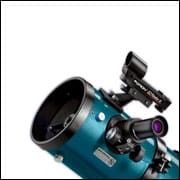 Good for entry-levels or mid-entry-levels, this scope is an amazing way to learn about space and planets. Wander freely among the stars with your kids, your friends or even all alone. 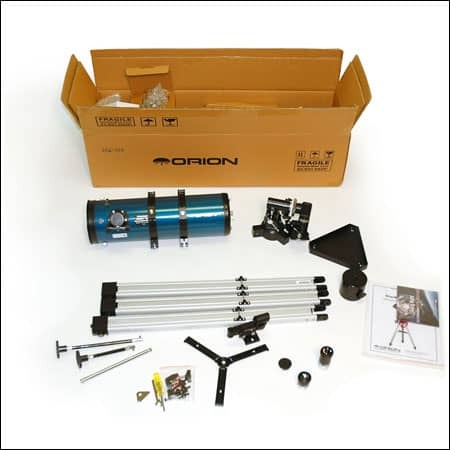 The Orion 09798 StarBlast 4.5 Equatorial Reflector Telescope makes a great gift for children or beginner astronomers who want to get to the next level of space-related knowledge. From the range of Orion telescopes for beginners, this scope is maybe the best. What is the Orion 09798 StarBlast 4.5 Equatorial Reflector Telescope? This is one of the best telescopes on the market. Excellent for families and quite good for children, this telescope has it all. First of all, for all its features, this telescope is quite cheap, and again, the scope comes fully prepared for exploration. Great for a newbie and rather good for an intermediate astronomer, this telescope offers clear optics at an affordable price. Easy to assemble and to use, this telescope is among the best scopes on the market. Before starting to use it, take your time, and read the manual, as you will find important information on how to use this telescope and how to handle an equatorial reflector telescope in general. With a 4.5 inch aperture, Orion 09798 StarBlast 4.5 Equatorial Reflector Telescope will provide some great images of the moon and or of any other celestial bodies. 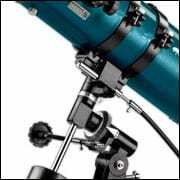 The scope comes with 2 incredible eyepieces, which are among of the best features of this telescope. The 15mm eyepiece provides a 30x magnification while the 6mm comes with a 75x magnification capacity. Start with the 15mm piece when you try to spot or locate different celestial objects, as it will provide a large and quite detailed view of star clusters and whatever you want to discover. Then, change it with the 6mm piece to increase magnification and have a better view. You can spend the night studying the rings of Saturn or the craters of the moon, even if you are a beginner in the field. With this super efficient optical tool for beginners, you will definitely go from newbie to pro in no time. Starry Night Special Edition astronomy software download card – with this card, you will have access to one of the best astronomy software, currently existing on the market, and you will be able to learn more and more about astronomy. Easy setup – you can literally set it up in a matter of minutes. Good aperture – the 4.5“ aperture makes it really easy to find celestial bodies. Portability – yes, this scope is quite light (a total of 17lbs), but it has no case, so it will be rather difficult to take it to a higher observation point. But if you buy a separate case which matches it, you can totally make this a travel scope. 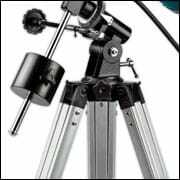 Stability – the scope comes with an aluminum tripod, making it a bit unstable. For more stability, you can put something heavy on the accessory tray, but even so, stability is not the strong point of this scope. The finder – even if the finder comes in the scope’s pack, which is great, there will be moments when the finder will stumble a bit making it difficult to align it with the telescope. Where to Find the Orion 09798 StarBlast 4.5 Equatorial Reflector Telescope? Orion 09798 StarBlast 4.5 Equatorial Reflector Telescope is a more than affordable telescope, which can offer perfectly clear images of the celestial bodies. Orion 09798 StarBlast 4.5 Equatorial Reflector’s price start from somewhere around $200, including all the pieces mentioned above. Amazon is probably the best place to purchase this telescope, the Amazon best price starts from $220 & FREE Shipping. 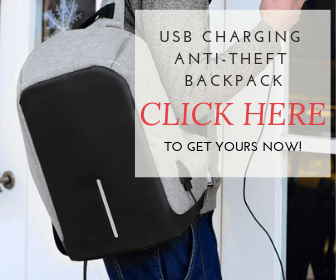 They will offer a variety of discounts and special prices, not to mention that their customer support is quite amazing. Your product will arrive safely in a matter of days and in the case of a problem, you can return it anytime. First of all, you need to pay attention to the place where you deposit your scope. Try to keep it in a dust and humidity free place. Also, remember to keep the eyepieces in a protective box. Whenever the scope is not in use, keep the dust covers on. Anyhow if the dust covers your lens, you will have to clean them. Be that eyepieces or mirrors, try to use a specialized lens cleaning fluid and a soft piece of cloth and remember not to rub too hard. The telescope’s mirrors are not to be clean so often, as this may damage the scope. Once a year would be the best period of time. Anyhow, as long as you don’t leave the Orion 09798 StarBlast 4.5 Equatorial Reflector Telescope uncovered, there is a small chance to have dust on your lens or on your mirrors. Starry Night Special Edition software to guide you in your explorations of the skies. Orion 09798 StarBlast 4.5 Equatorial Reflector has a full warranty assured for a period of up to a year provided that no damage has been inflicted to the scope. Actually the warranty covers any defects that may appear in the material, due to the workmanship and not due to intensive use, for example. A small detail to keep in mind, the only person to benefit of the warranty is the original purchaser of the piece. If the issue is more complicated and the repairs would last too much, Orion will change your scope with a brand new one. Do not try to repair the Orion 09798 StarBlast 4.5 Equatorial Reflector Telescope by yourself, as this will lead to the automatic cancellation of the warranty. This is a rather simple and ready to use telescope that will fully satisfy the needs of a beginner astronomer. Its lenses are absolutely great. Actually, the best parts of this telescope are the optics. Simple and amazing, this telescope will guide you in the wonders of the universe. The moon, Saturn, Jupiter, nebulas and stars are waiting for you, your family and friends. 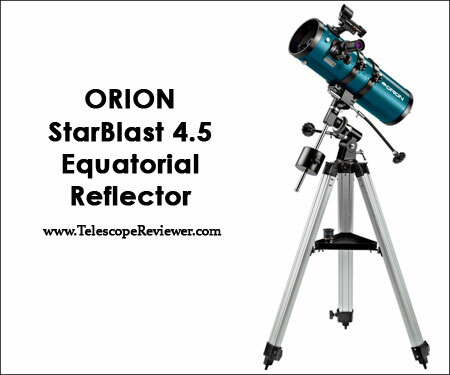 We strongly recommend the Orion 09798 StarBlast 4.5 Equatorial Reflector for any beginner astronomer.